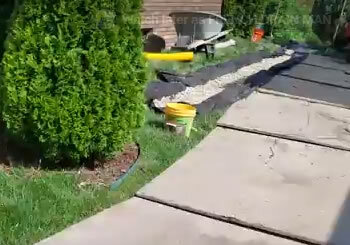 We are yard drainage contractors in Macomb County, Michigan. We’re working with a laser level to take readings. Laser level, you could set the laser to a pitch or you could set the laser to just read level. We’re working with it right now to where it’s level so that I can find out where the high spots and low spots are. On the side of this house, it’s flat there is no slope. They’re retaining while you see it’s all flat. Somebody put in a downspout and just ran it into a location where it’s flat and the water is going nowhere. It’s causing problems there is a leak in the basement. We’re going to run this downspout to where our laser level tells us we have fall. We have to run it all the way out to the middle of the front yard where we finally have enough fall to where the top of the downspout admitter is lower than the bottom of the trench, up there by the downspout. For yard drainage contractors with experience, give us a call at 586-752-2200.